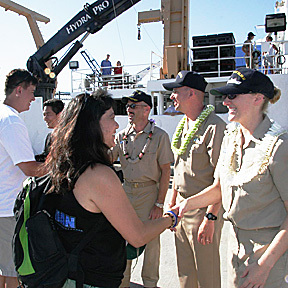 Teachers at Sea: Teacher Cobey Doi was greeted yesterday by Capt. Scott Kuester, Lt. Commander John Caskey and Ensign Sarah Jones, right. Doi and nine other educators embarked on a 10-day trip to the Northwestern Hawaiian Islands aboard the National Oceanic and Atmospheric Administration vessel Hi'ialakai.